Fever or normal… busy or not so busy… hot, humid or cool, breezy… I need at least one cup of tea every day. Tea is something that I always look forward to — in a day, at any time of the year. After an exhausting week or a day I need a cup of tea. It makes me feel like I’ve regained my senses. I don’t care what time of the day or night I reach home but I’ll take the trouble to make it and drink it. If I’m back after a tiresome journey I need my energy drink first, that would be- a cup of tea. Then I just go off to sleep. That would be like a dead dog. Oh! And before going off to sleep I keep my mobile in silent mode, no disturbances you know. Even if I forget I don’t care. I just sleep….cause I’m too tired and nothing or no one can then wake me up.There have been instances in the past when my phone was ringing and I had nicely received the call, mumbled a faint hello,and kept it next to my ears and continued with my sleep; irrespective of who was on the other side of the line. I found out that it was my mom, many times, and my boss, once. Wow! Ice creams. Who doesn’t like ice creams? I love them, I love them and I love them. So, what flavor should be mine? Basically you are saying that today I can enter this ice cream parlor and make my own wacky flavors. If I concentrate on the “wacky” part then my ice cream can be almond flavoured (I think it will taste good nutty and creamy), then I’ll go in for a watermelon flavoured ice cream (the fruit is so refreshing during summers… and so that should be my flavor #32). How about trying something new for your taste buds and introducing the flavours of flowers. That would be great, don’t you think. I’ll go in for a lilly flavor and a lotus flavor. No reason, they are my favourite flowers. Where did the ‘essence of my personality’ go in the wacky flavour. That could only mean one thing to me- TEA. I think I’ll like to combine the two. After all it reflects not only my personality but is my identity. My mornings are grey without a cup of tea. And since it’s summers I would love to combine the two. So, a tea ice cream for me, please. The only difference will be I’ll be having it in a bowl instead of a cup. I’ll be eating it instead of drinking it. I’ll not have to boil the water, add sugar and tealeaves but just scoop some ice cream from the box. Oh! and I’d like it to be a little strong, please. Let me start, by apologising for the delay in the post. Well, you could think that the Christmas preparations would have kept me busy, that is a valid reason. However, I would like to add another reason for lagging behind. I’m a little new to blogging and after reading through the posts of other nominees, fellow bloggers and of course after doing a little research on Google I found that being nominated here means you are awarded. So, I got the notification and was happy but I shouted “YIPPEE!”, only after reading this somewhere “If you are nominated, you’ve been awarded too”. There couldn’t have been a better way of getting a better gift for Christmas than getting nominated/awarded by my fellow blogger for two awards. 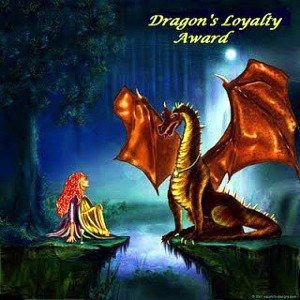 I’ll like to thank Sheen Meem who nominated me for “The Versatile Blogger Award” and “The Dragon’s Loyalty Award” . I’d also like to thank her for finding time to read my blog and showing her love for my work in such a humble and generous way. The link to her blog is: http://flowersandbreezes.wordpress.com. I found her through Daily Prompts and like to read her blog. Announce your win with a written post and link to whoever presented your award. Drop them a comment to tip them off after you have liked them in the post. There is no greater joy than sharing, so I would like to pass on the awards and nominate these bloggers. I’ve always enjoyed the posts of these bloggers. The writing styles of each one varies and is engaging. I hope you also enjoy! I prefer tea to coffee and can have tea any number of times in a day. I’m addicted to reading and a daily dose of half an hour is compulsory. I love pets but I don’t have any. When upset,sad or depressed I like to cook. I respect all humans and things alike. I like winters than summers. Again a big thanks to Sheen and congrats to those who are nominated.